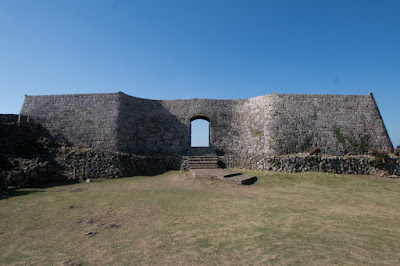 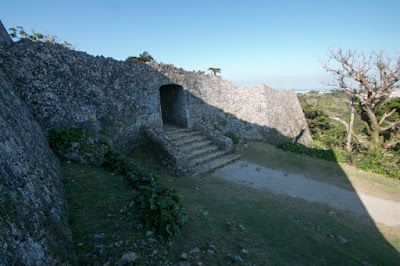 Nakagkusuku castle (中城城) is located on Daijyo hill at the east coast and 20km northeast from Naha city. 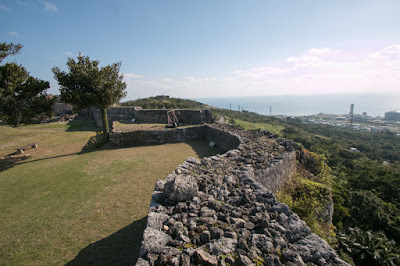 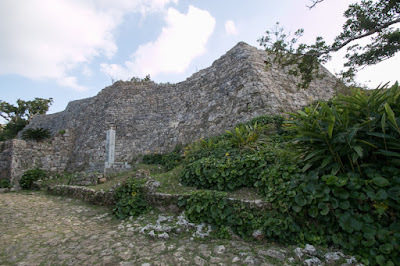 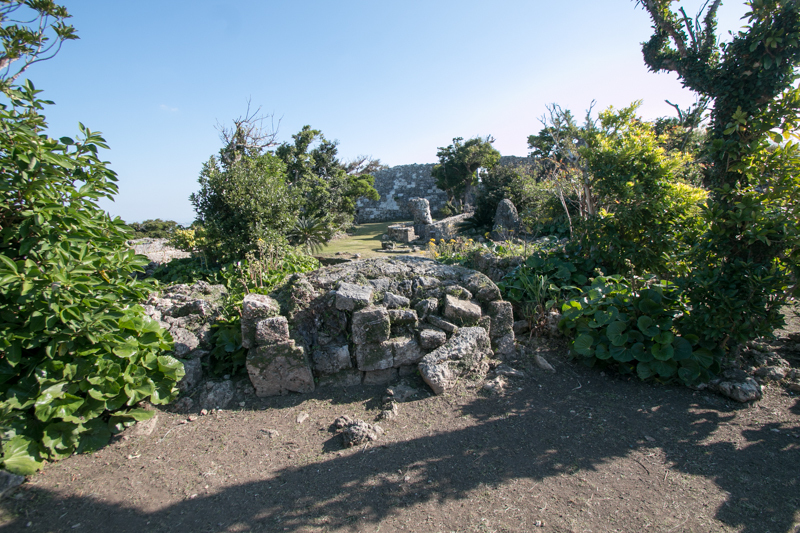 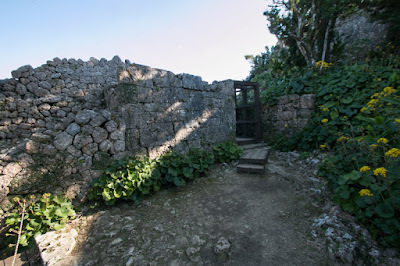 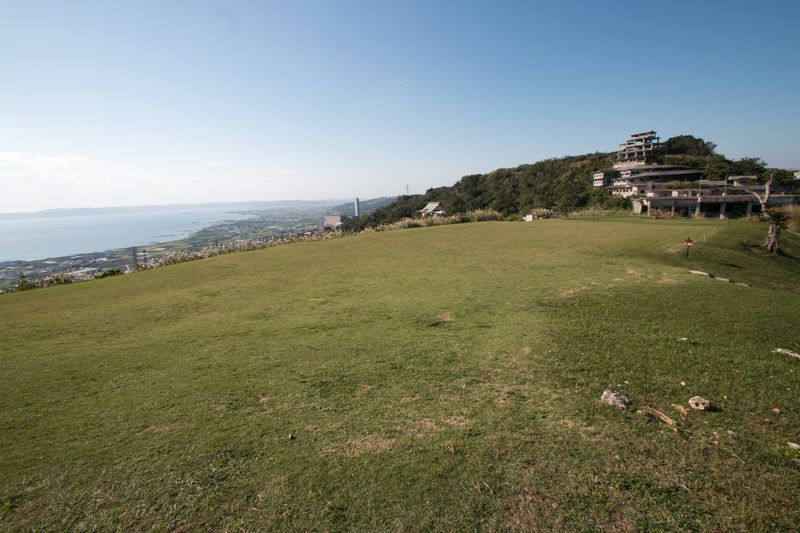 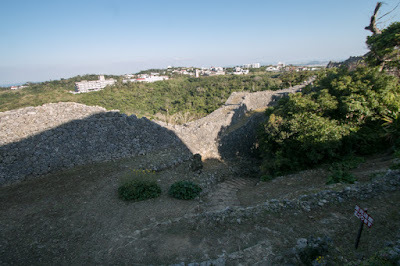 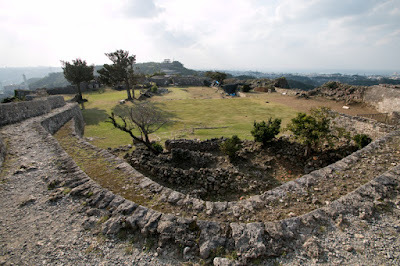 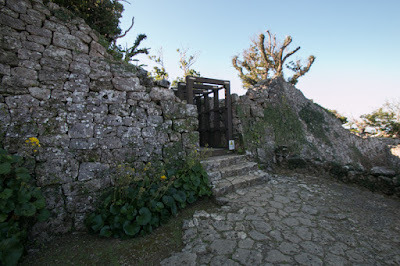 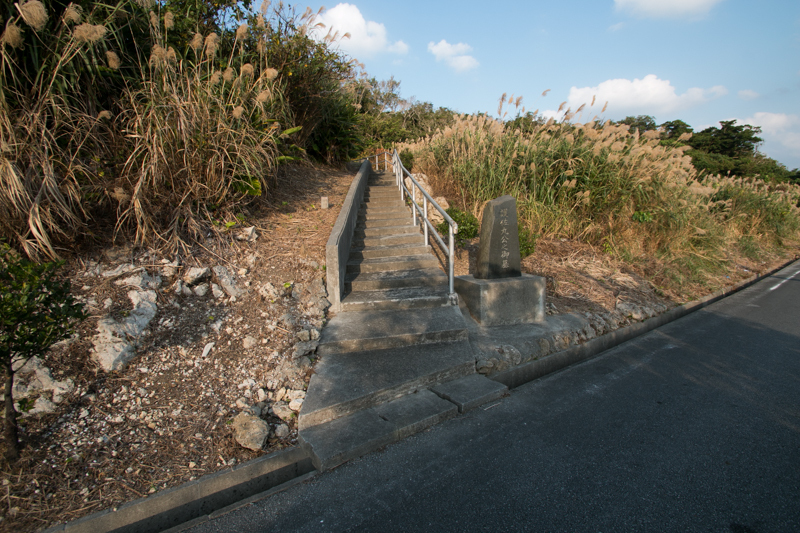 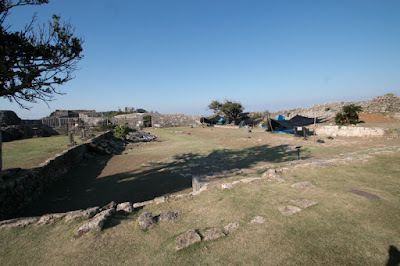 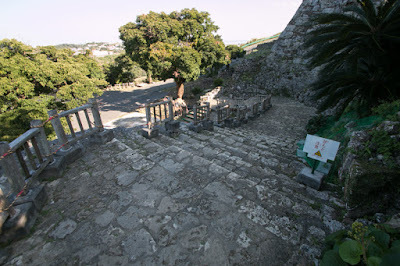 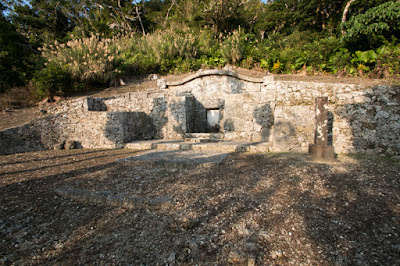 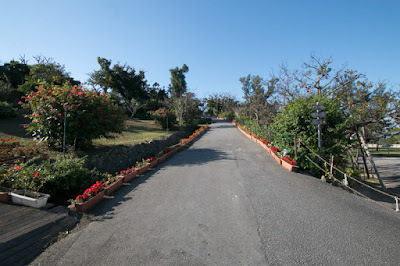 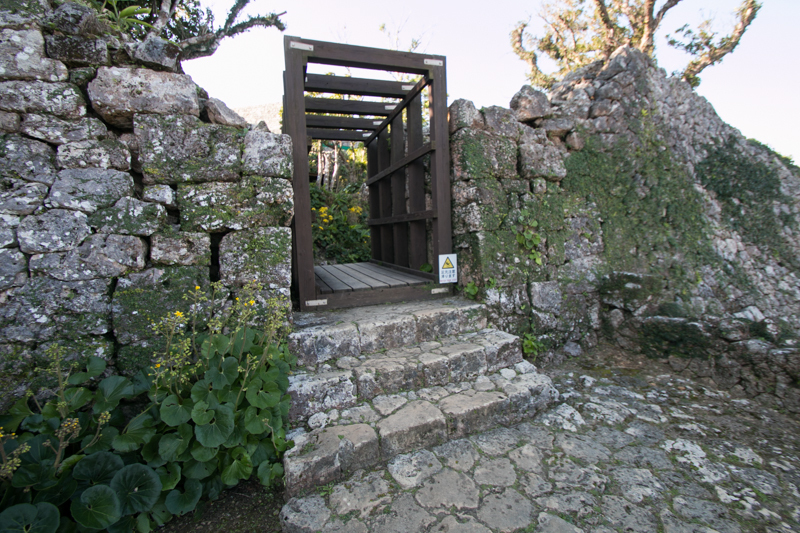 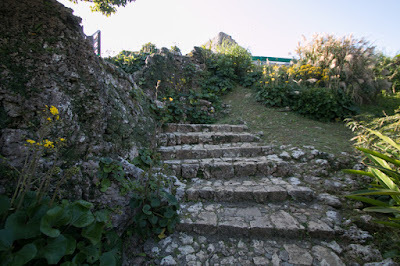 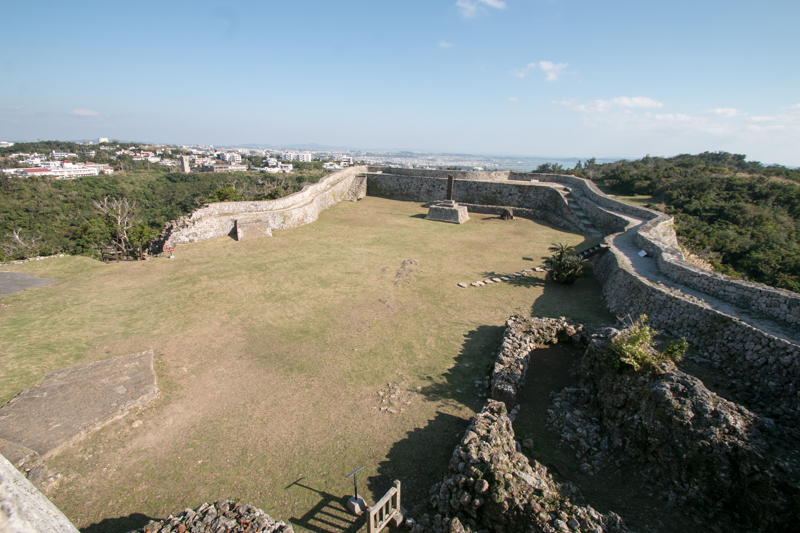 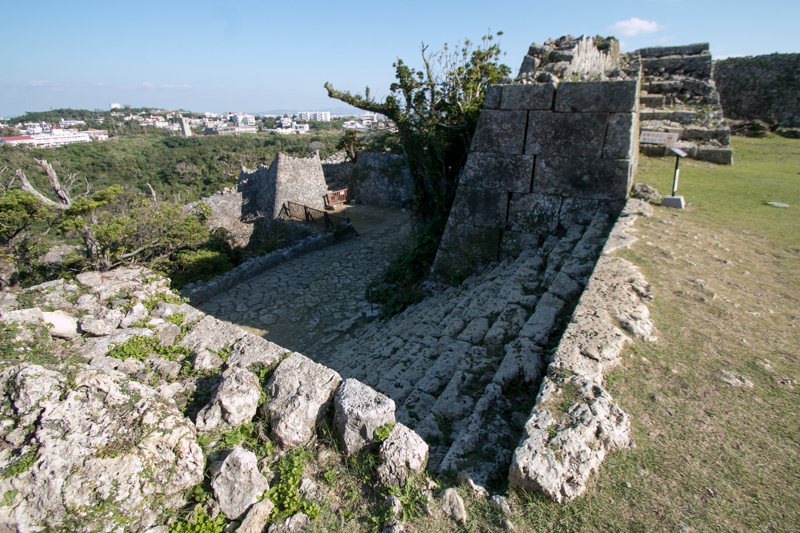 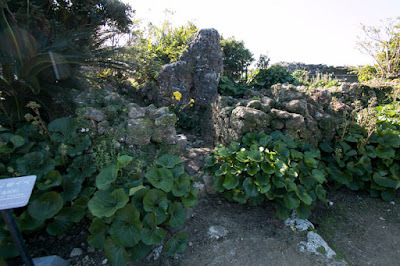 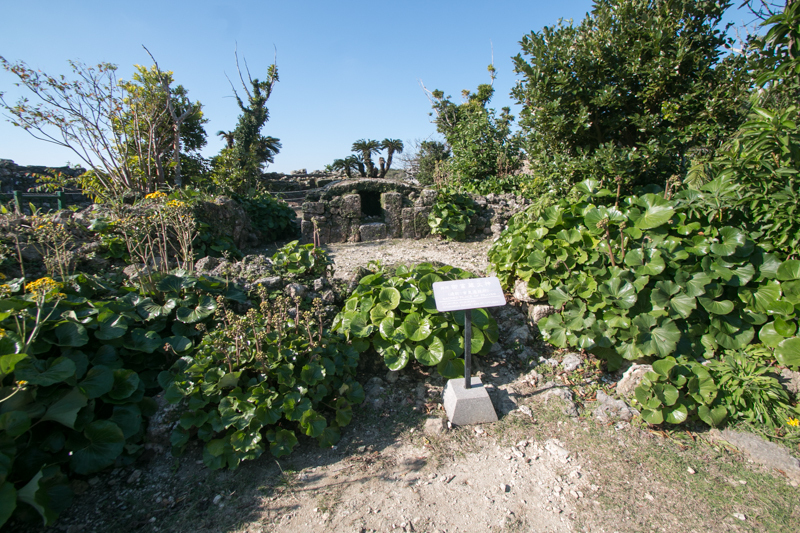 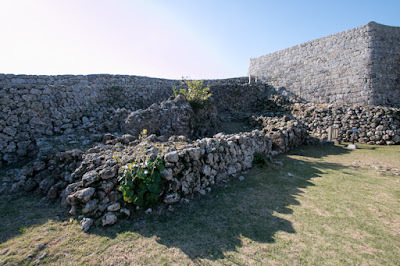 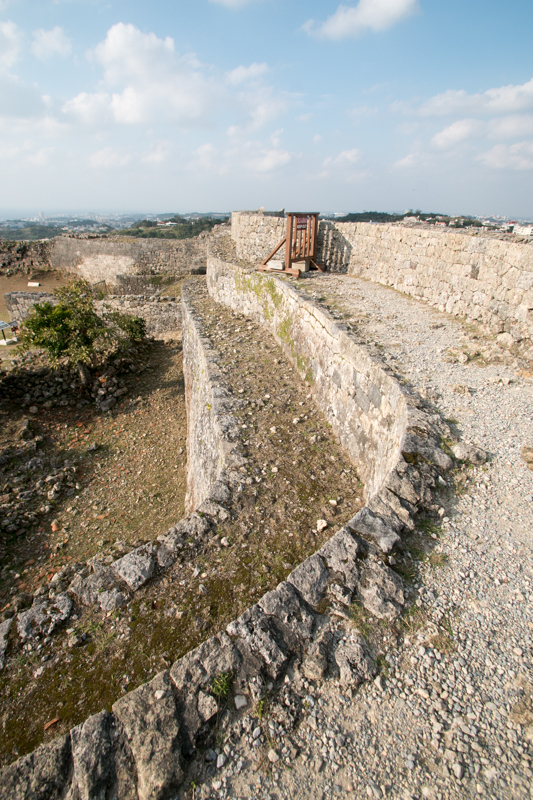 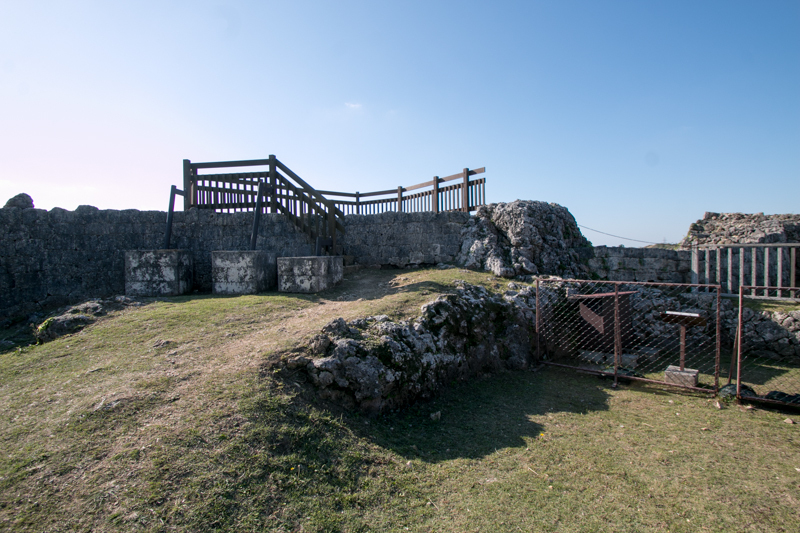 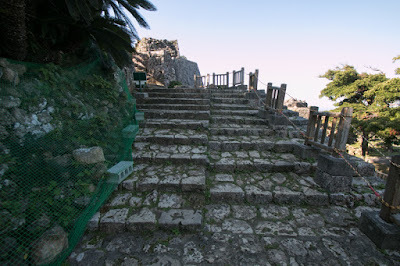 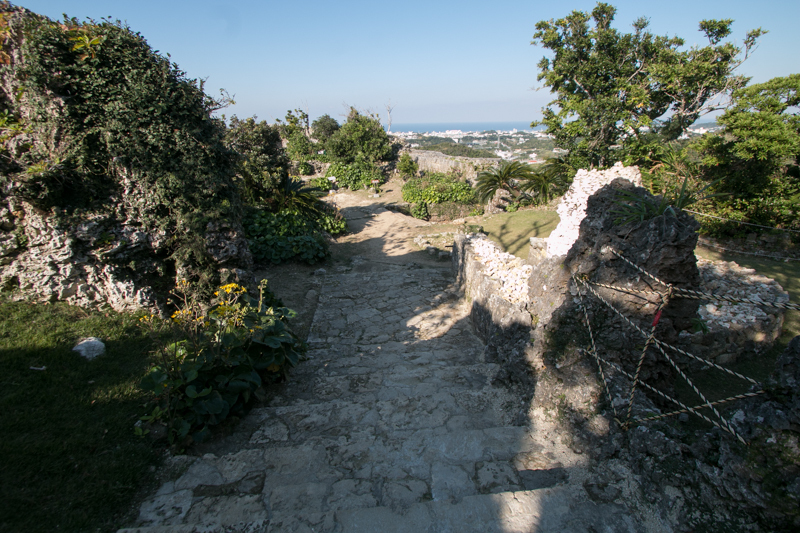 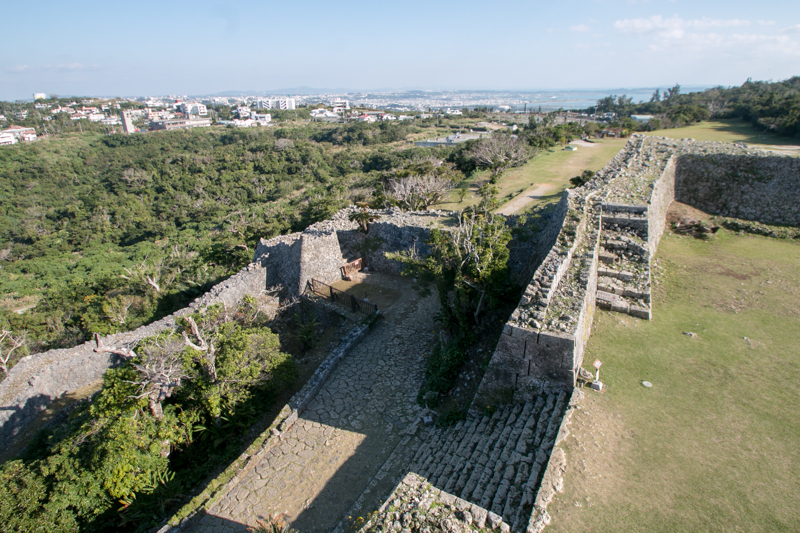 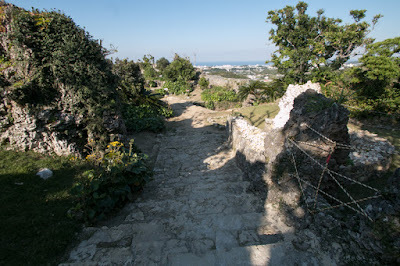 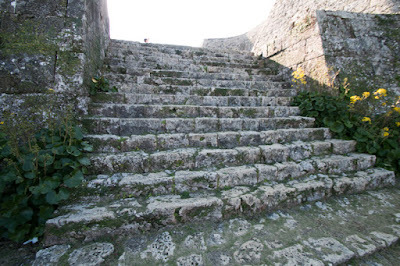 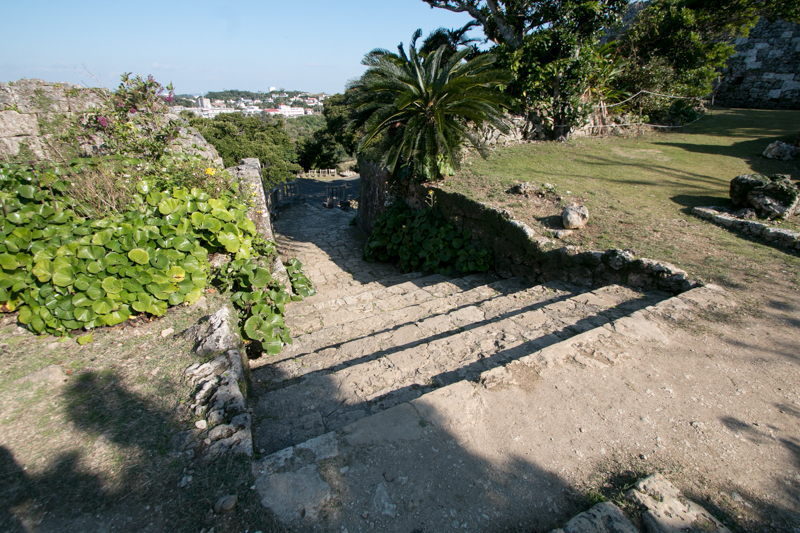 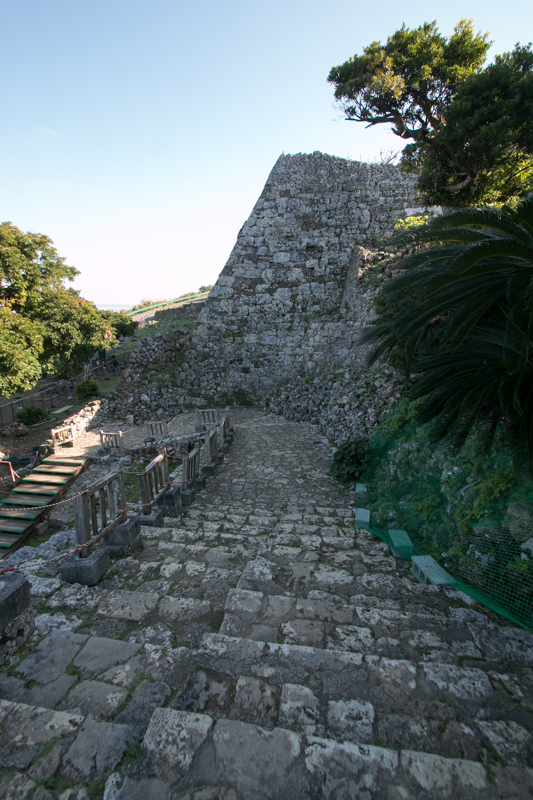 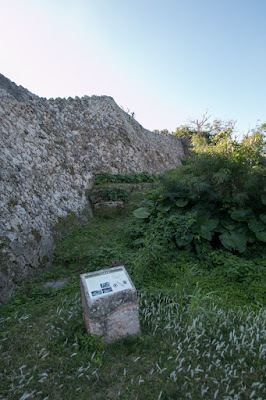 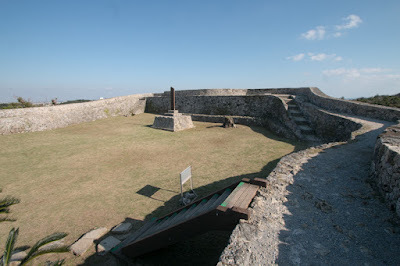 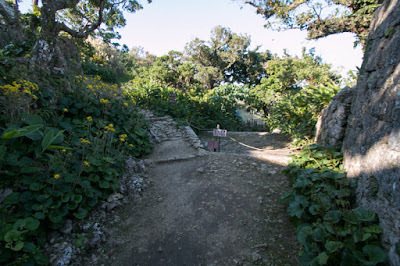 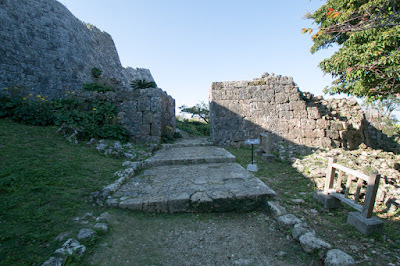 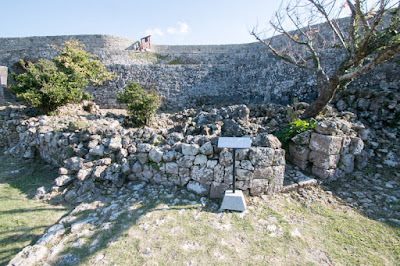 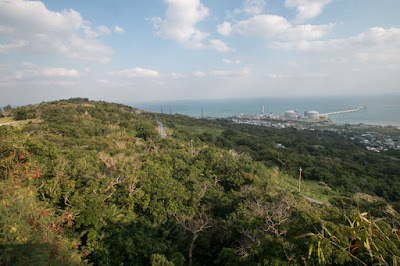 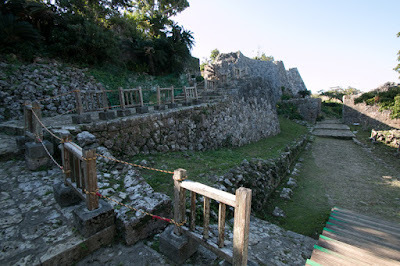 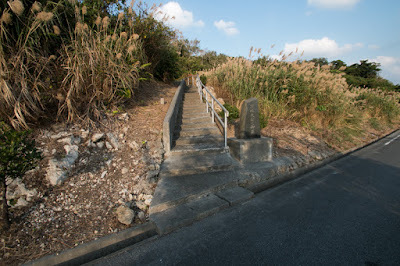 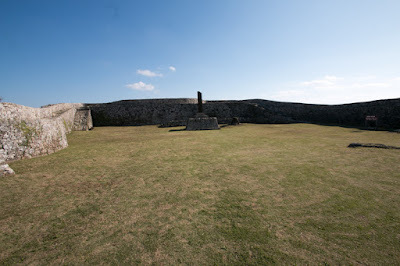 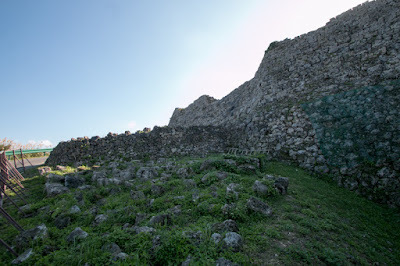 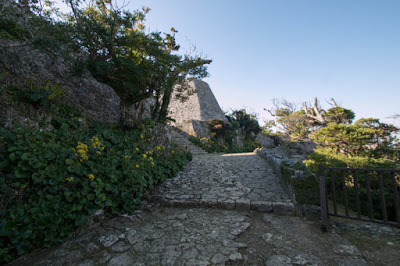 The site of the castle is a hill area stand at neck of the island of 5km width, and this castle was an important gate to Shuri area (current Naha city), the capital of Okinawa kingdom, from north side area. 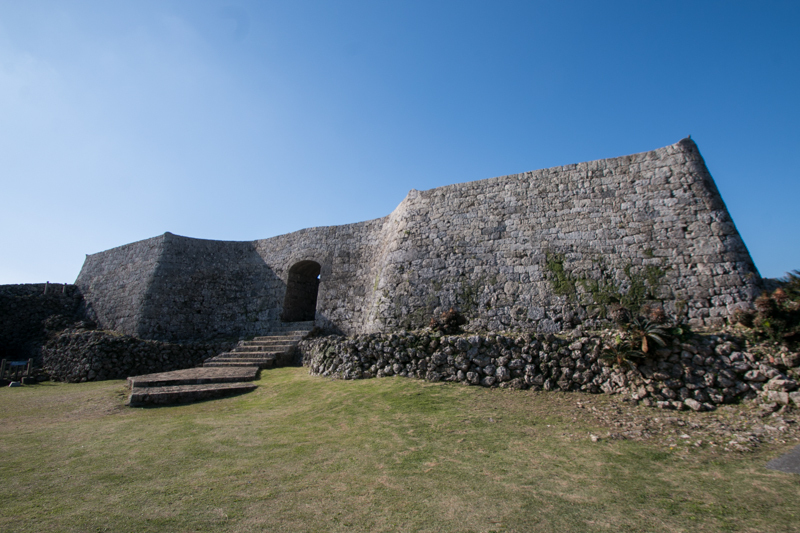 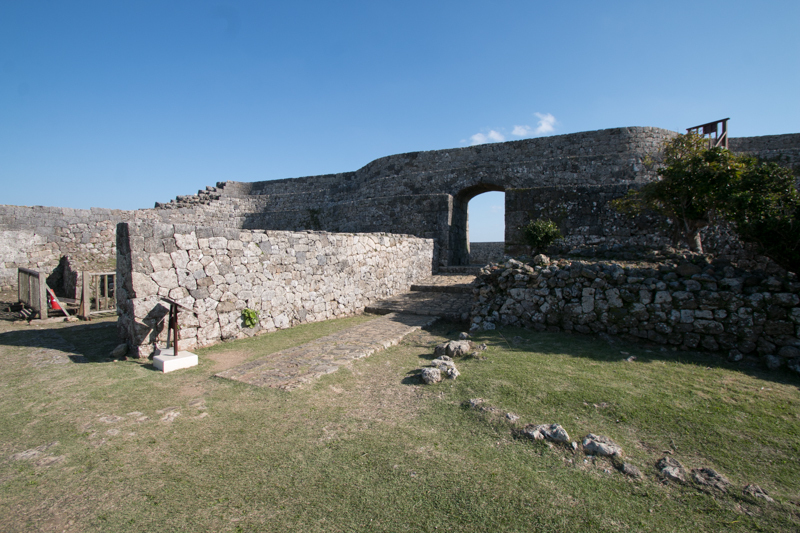 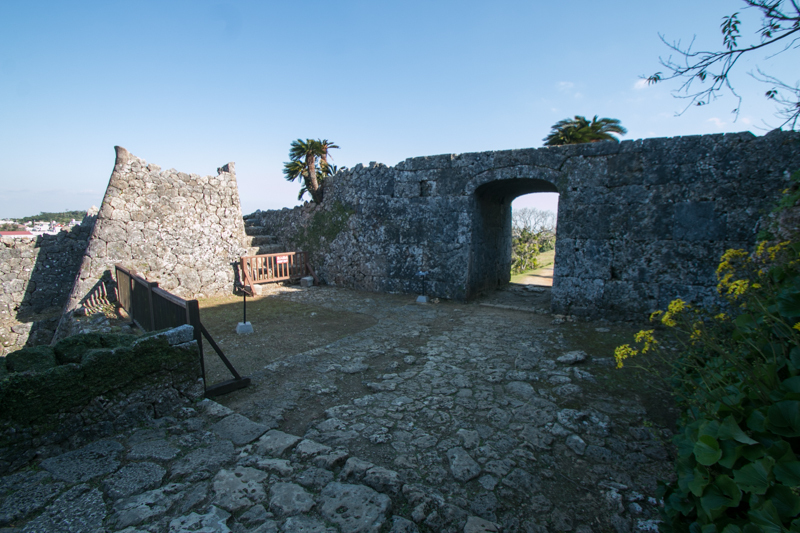 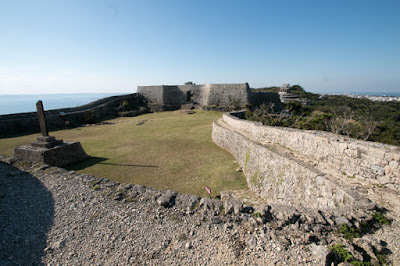 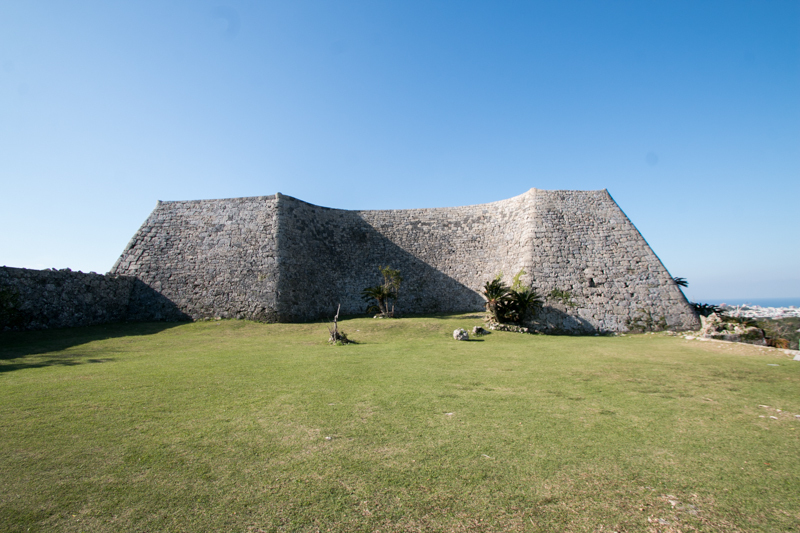 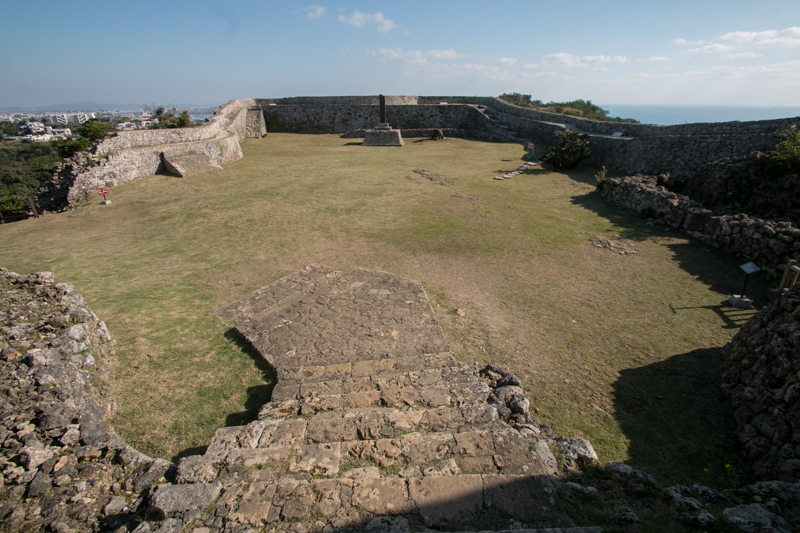 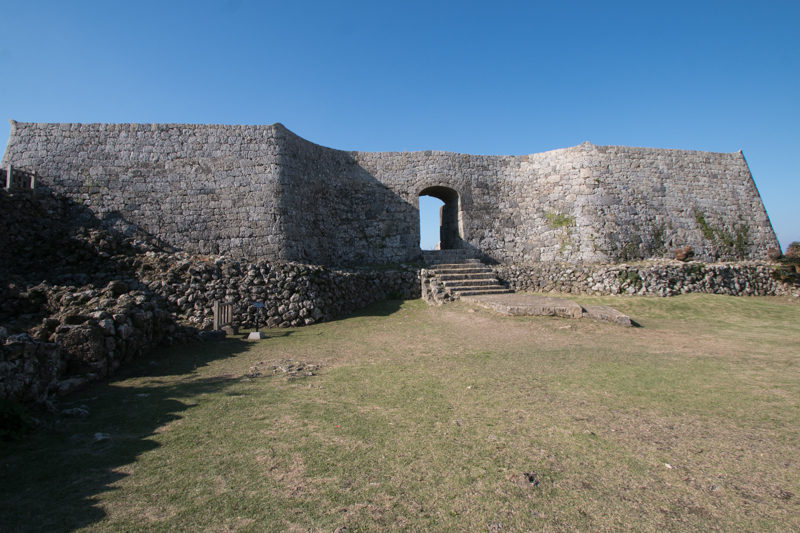 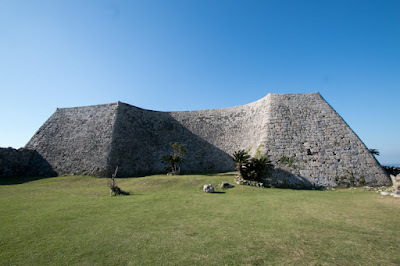 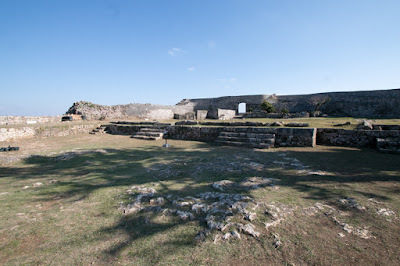 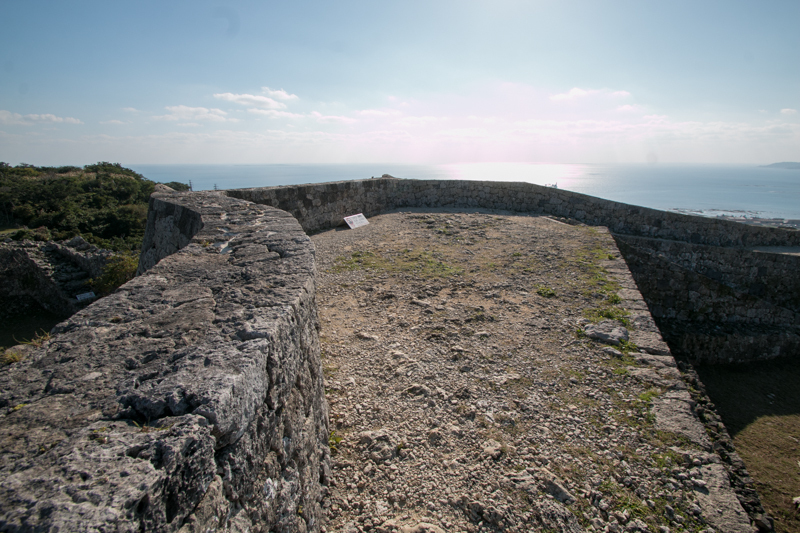 Nakagusuku castle was originally built by local clan during 14th century, and expanded into the largest fort of Okinawa Island by Gosamaru (?-1458), regarded as a greatest general in Okinawa history. 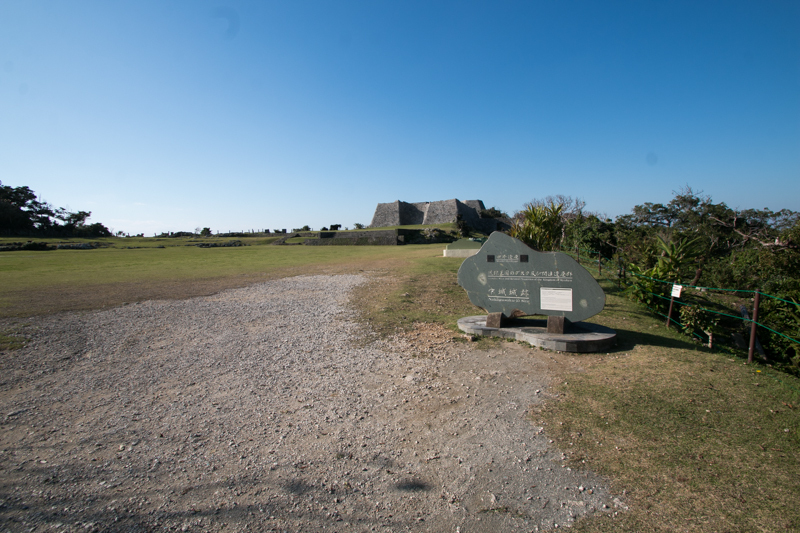 At the mid of 14th century, Okinawa island was divided into three kingdom, it mean Hokusan at north area, Chusan at middle area and Nansan at south area. Each kingdom fought for the hegemony of Okinawa island, but by the end of 14th century the power of Chusan kingdom became stronger than other two kingdoms due to trade with and culture from China. Gosamaru was born as a descendant of former Hokuzan kingdom. 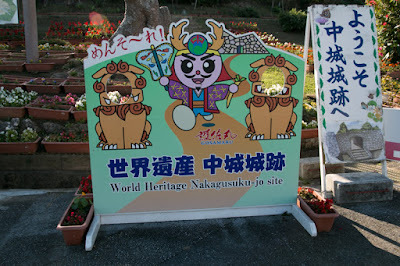 His ancestor was a king of Hokuzan, but had to leave the position of King. 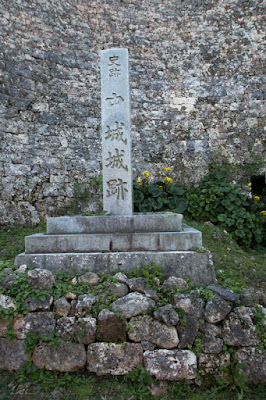 Sho Hashi (1372-1439), king of Chusan at that time, hired and assigned Gosamaru as a general focusing on his talent and linage. In 1416, Sho Hashi attacked Nakijin castle, residence of Hokusan, and Gosamaru fought bravery in this battle. 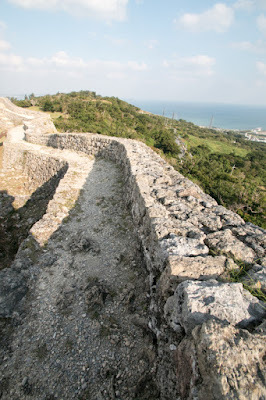 Finally Hokusan kingdom was extinguished, and Gosamaru was ordered to build Zakimi castle at west coast and near the border to former Hokuzan kingdom, to watch the movement of former Hokuszn area. In 1429, Chusan kingdom defeated Nanzan kingdom and united whole Okinawa island, then established Ryukyu Kingdom. Gosamaru made exploits on this campaign. Gosamaru served six generations of Sho clan, and became the highest veteran general of new kingdom. 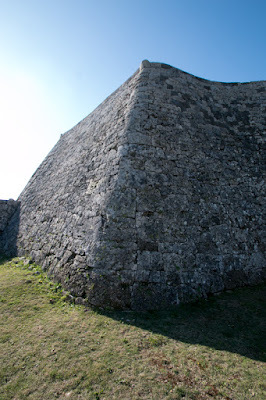 Gosamaru was not only good at tactics, he was also a good castle builder. Further he engaged in foreign trade by himself, and improved commercial activities of his territory. But just at that time, Amawari (?-1458), an ambitios lord of Katsuren castle at the base of Katsuren peninsula, grew their power by foreign trade. For the purpose of watching and restraint Amawari, king of Sho clan ordered Gosamaru to build a new castle at the place of current castle in 1430. 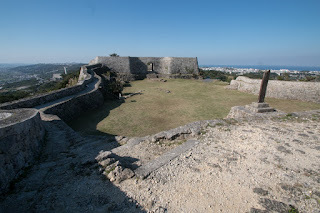 The place of castle is at the middle of Katsuren castle and Shuri castle, the capital of Ryukyu kingdom, and an appropriate place for the purpose. After 10 years construction, Nakagusuku castle was completed in 1540. 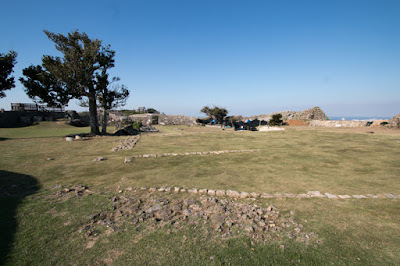 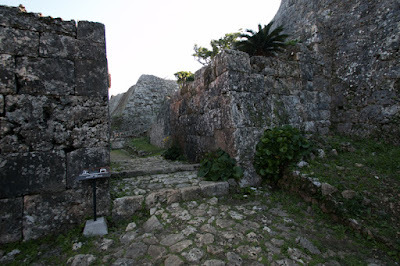 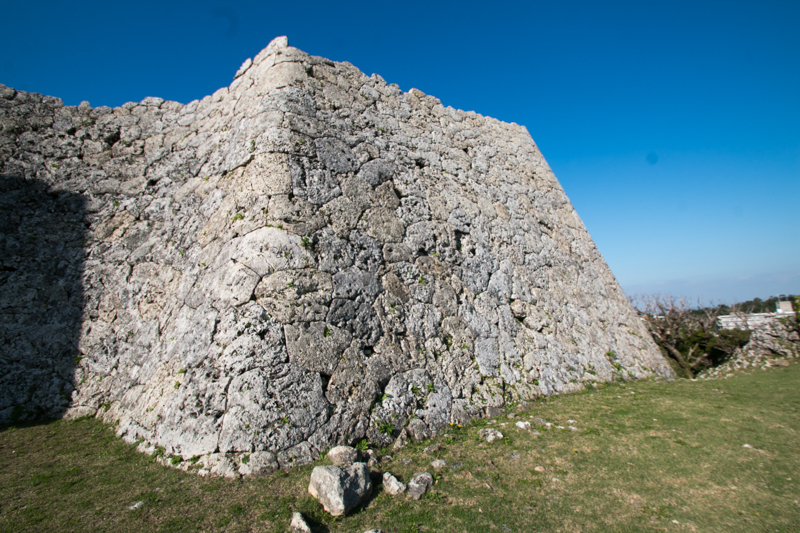 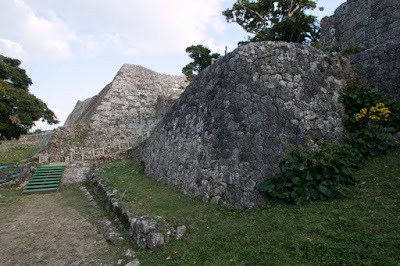 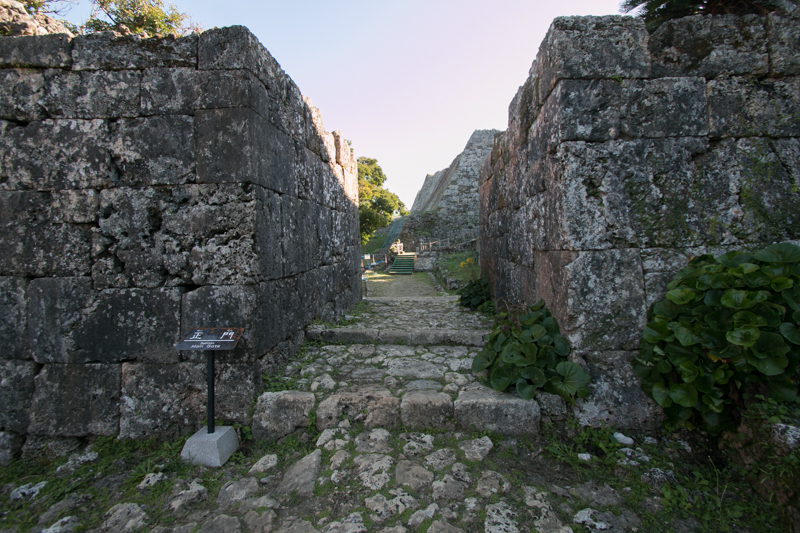 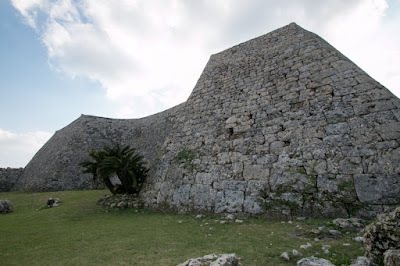 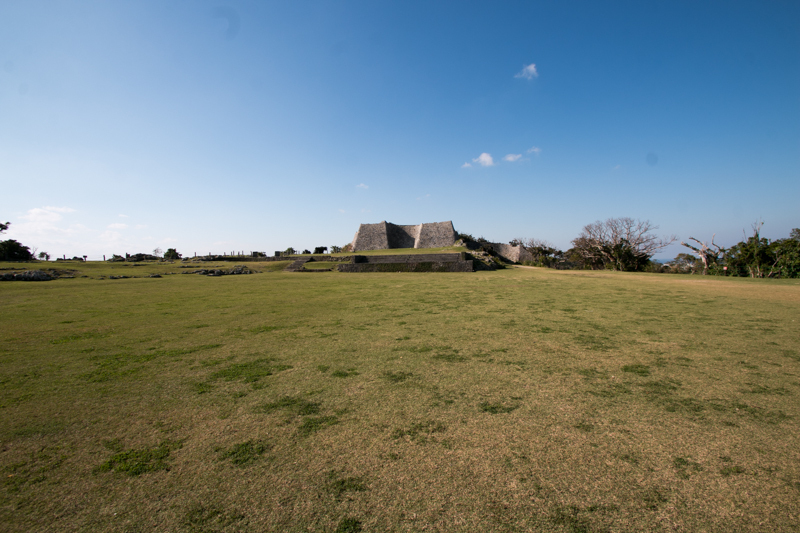 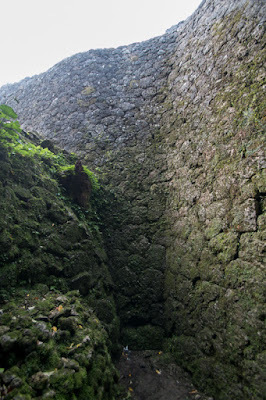 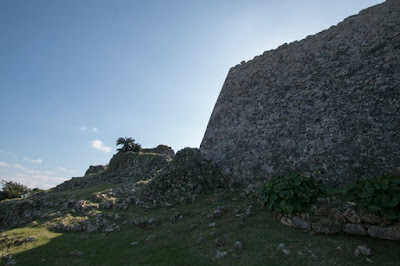 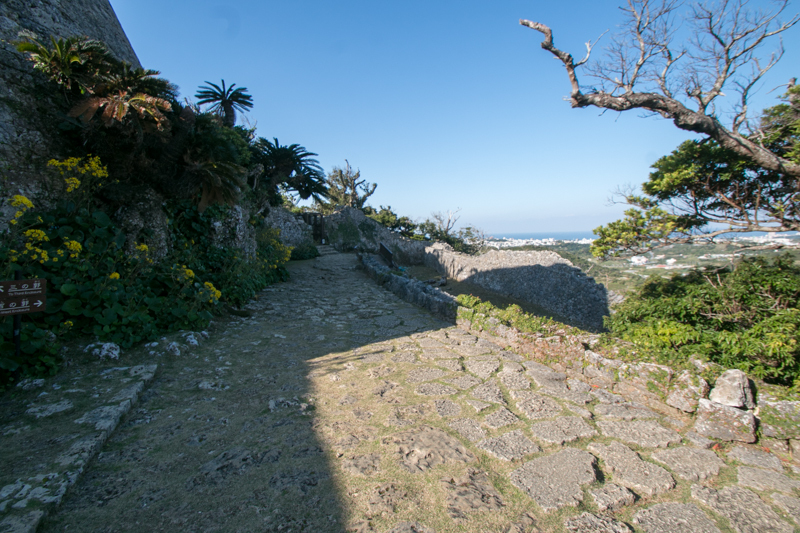 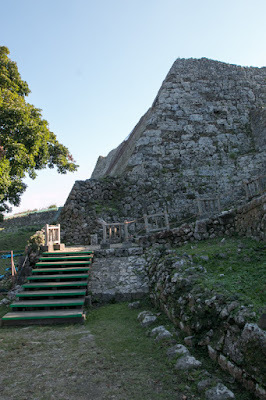 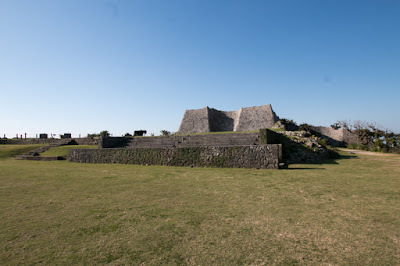 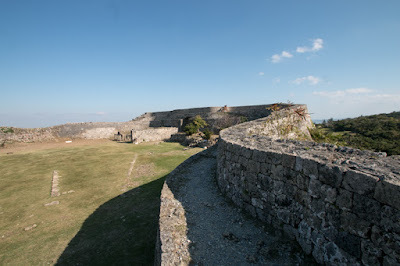 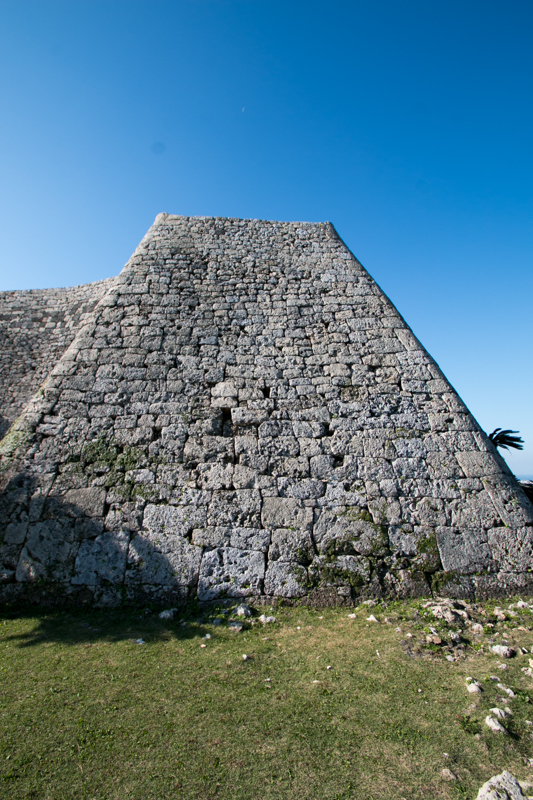 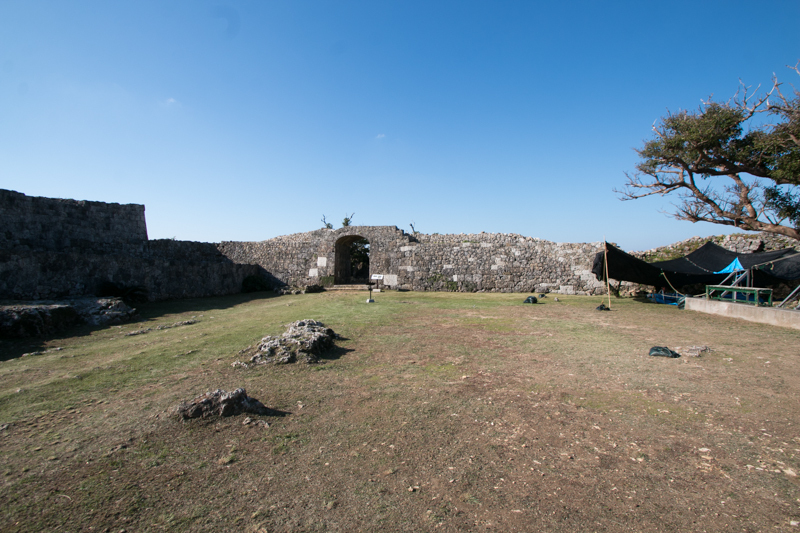 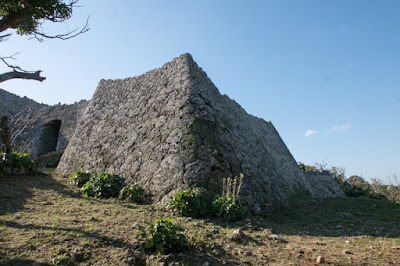 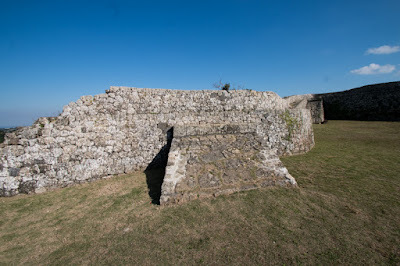 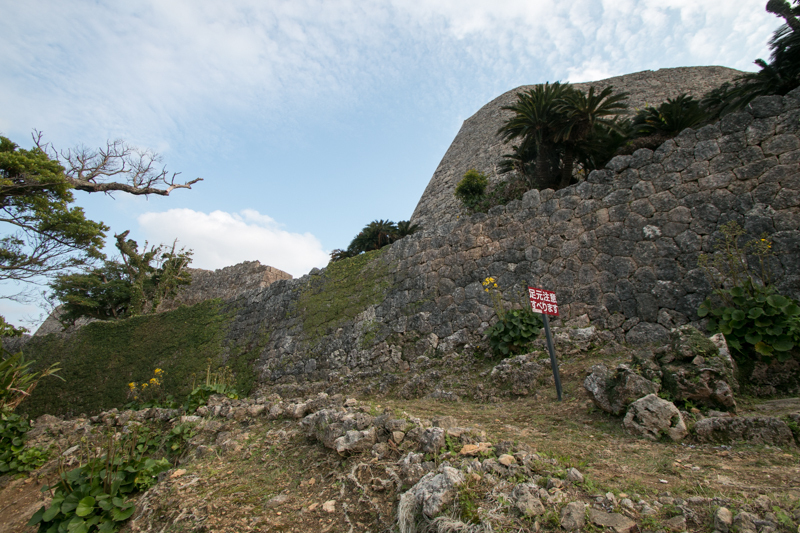 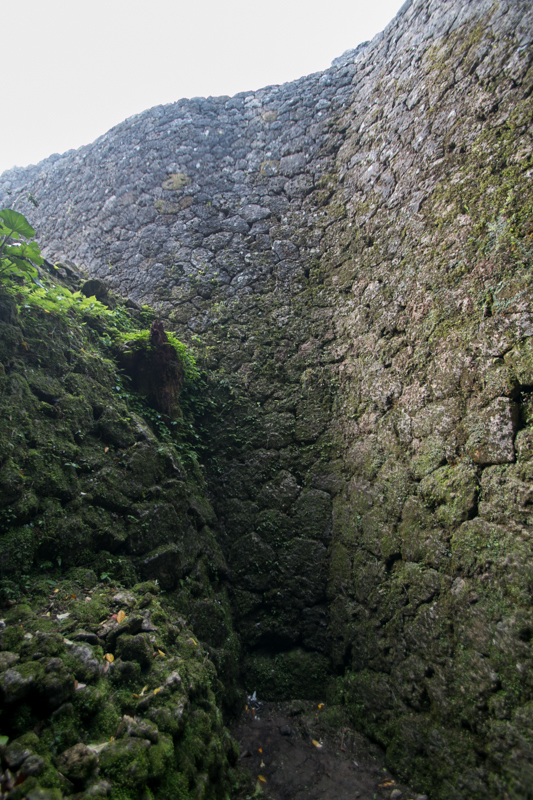 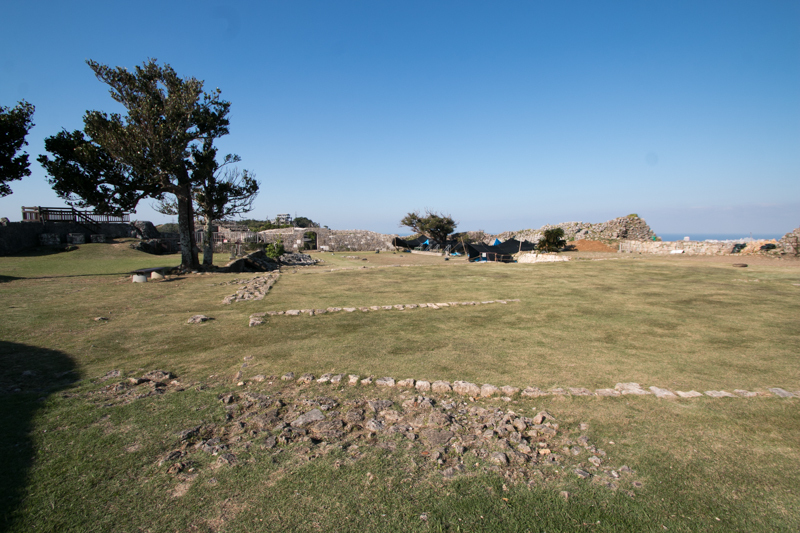 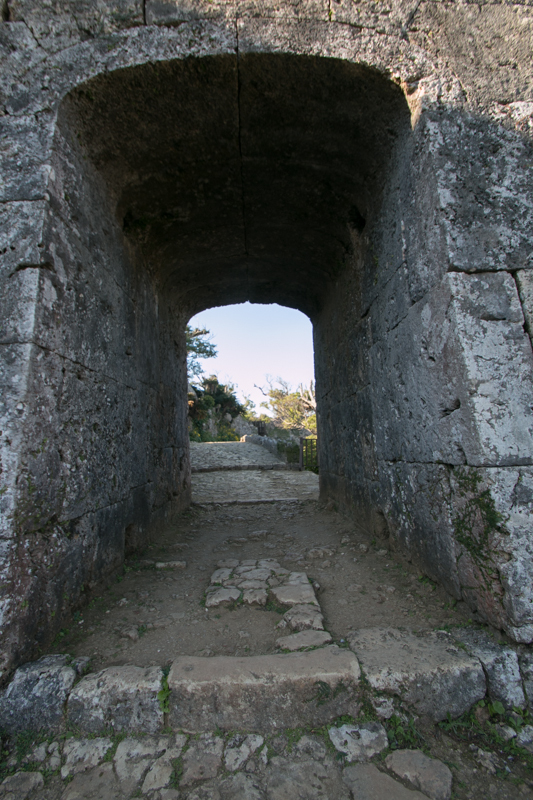 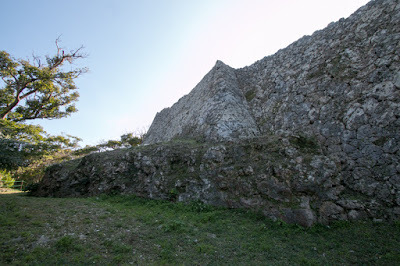 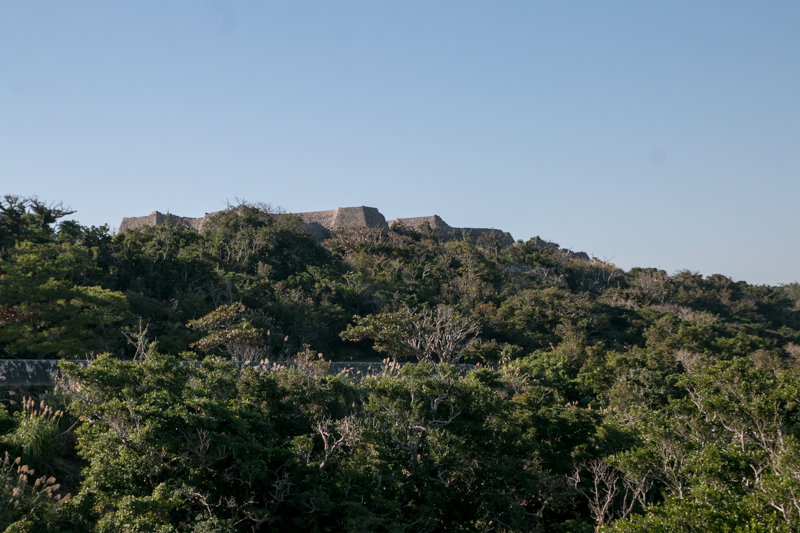 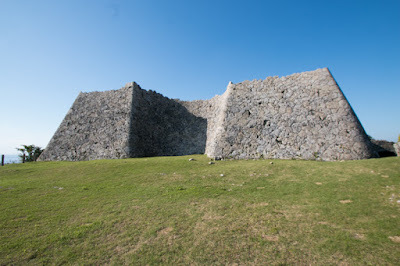 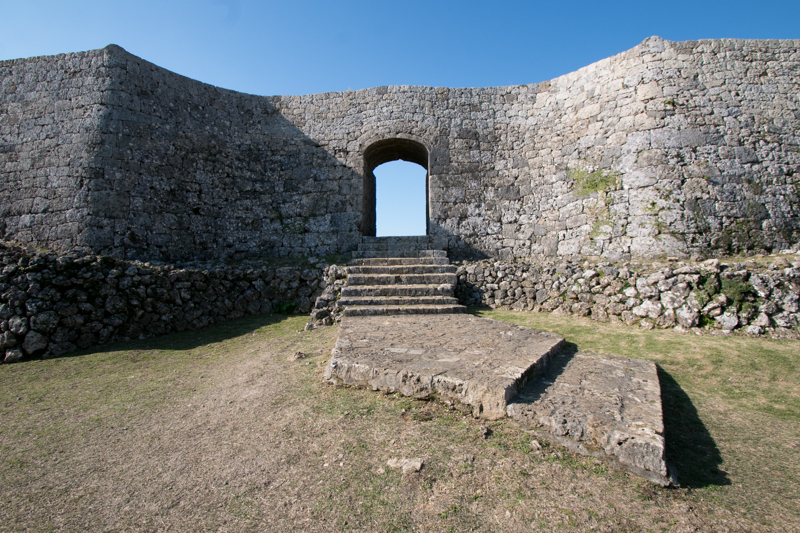 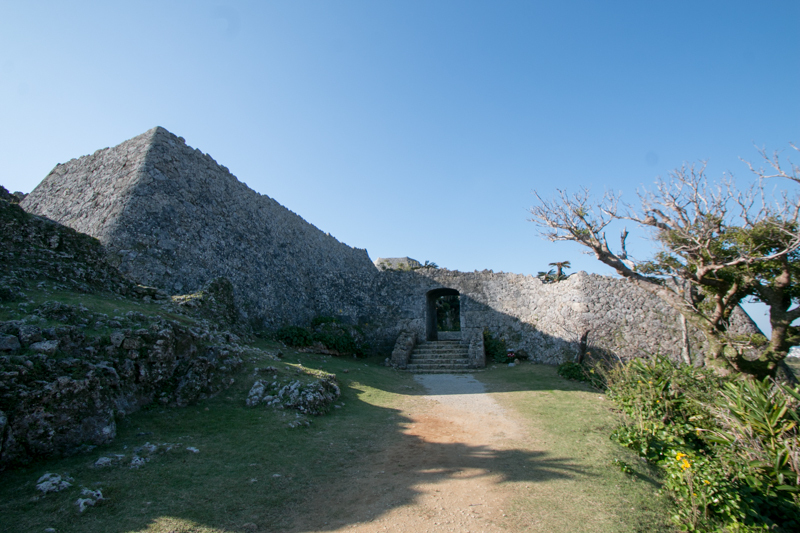 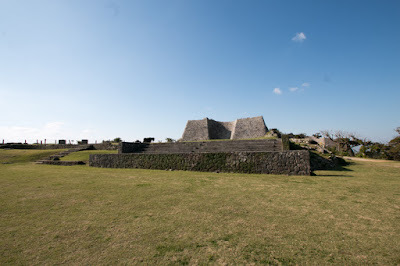 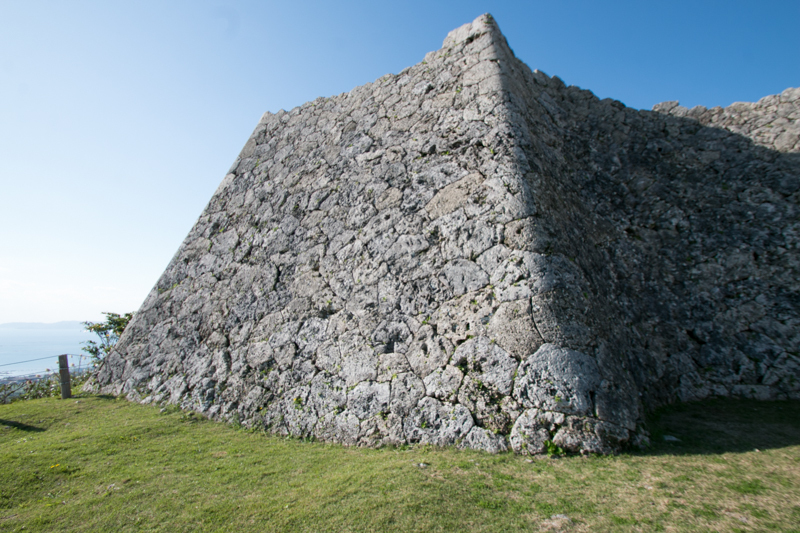 The size of central areas Nagusuku castle was about 200 meter width and 400 meter long. 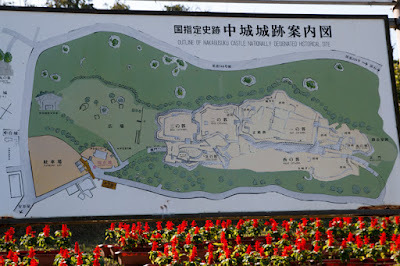 Main areas consist of four areas placed in line, and outer areas surround main areas. 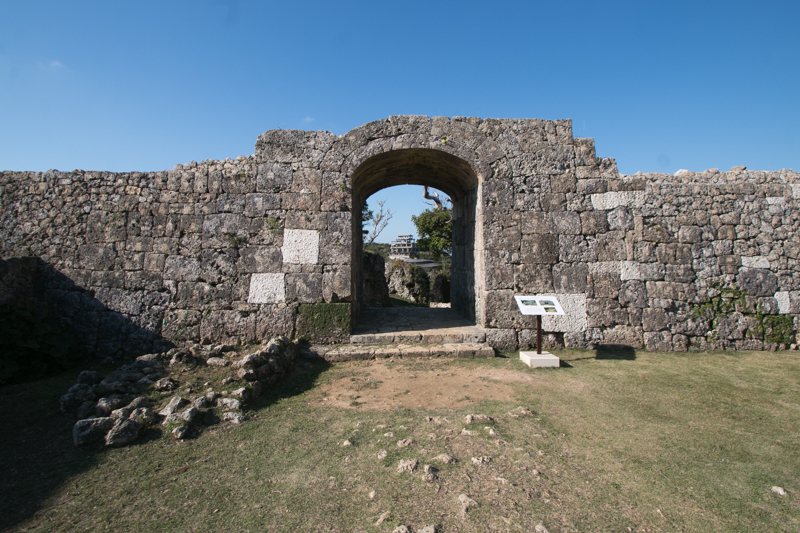 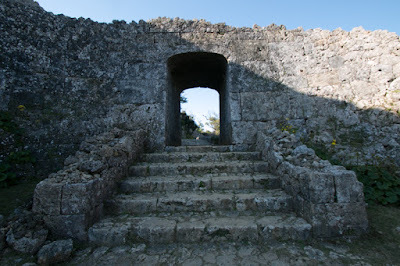 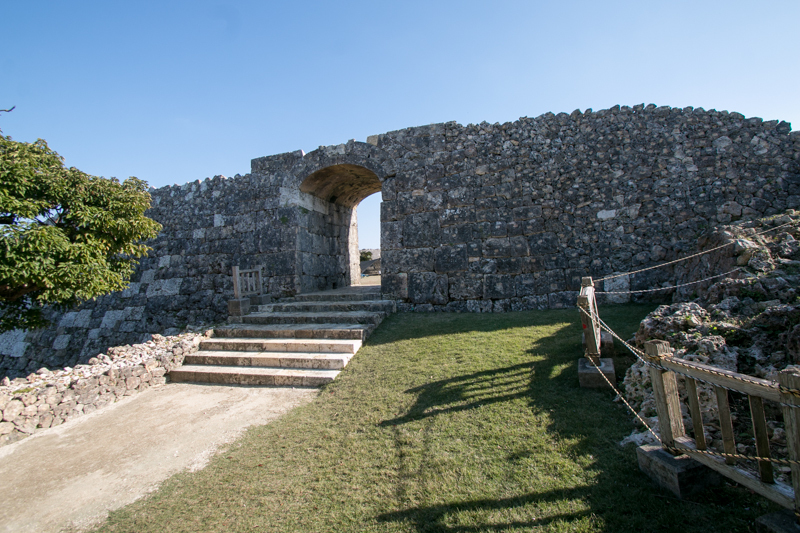 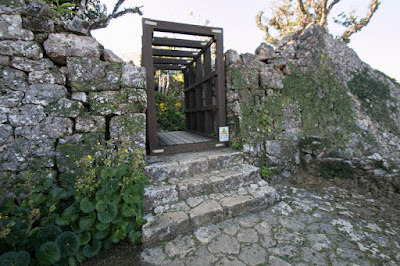 Main areas are surrounded by tall stone walls different from older castles, and both east and west edge of the wall there existed secure gate with beautiful arch. Even though it was smaller than palace castles such as Shuri castle or Nakijin castle, it is the largest and secure fortress of Okinawa island. 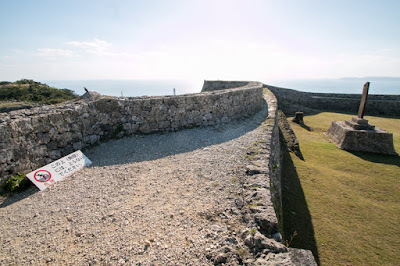 In 1853, Mattew Perri (1794-1858), an American admiral visited Japan for negotiation of opening country, anchored his fleet at Okinawa island to wait the decision of Edo shogunate. 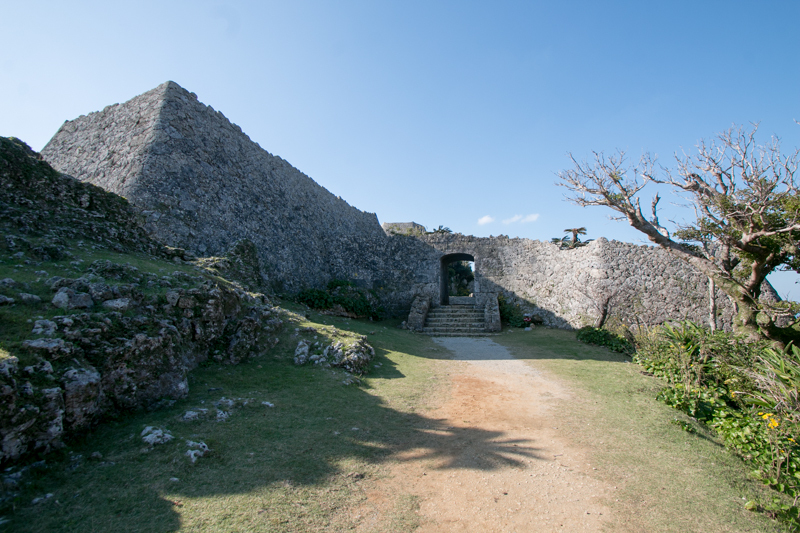 It is said that he visited Nakagusuku castle and praised as a masterpiece of the castle. 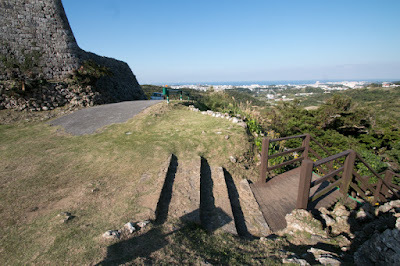 In the mid of 15th century, Amawari at last started his action to seize Okinawa Island. 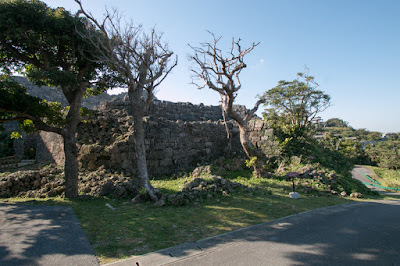 He made a false accusation that Gosamaru attempted rebellion to Ryukyu kingdom, and assaulted Nakagusuku castle as a commander of the kingdom. 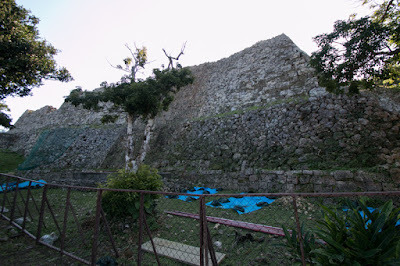 Gosamaru just had a moon viewing party, but knowing attack of Amawari, Gosamaru did not resist and suicide with his family. 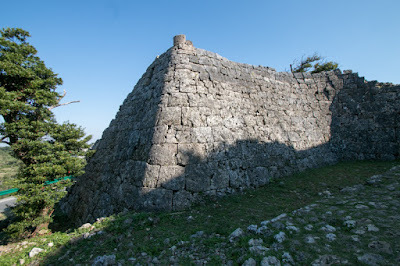 Amawari who removed strongest rival next planned to invasion to Shuri city, capital of Okinawa kingdom, but knowing his attempt by report from Amawari’s wife (princess of Ryukyu kingdom), King of Ryukyu kingdom made a preemptive attack to Amawari and extinguished him. This series of accident is called as the accident of Gosamaru and Amawari, and the largest and last internal war of Okinawa island. 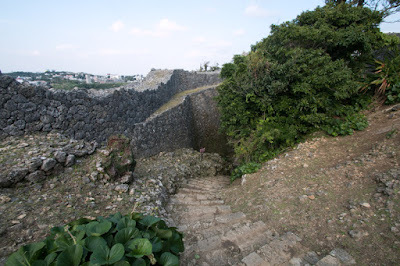 It is not clear Gosamaru truly attempted rebellion. 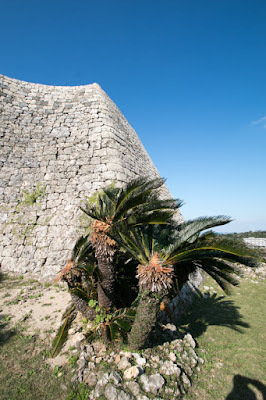 Gosamaru might actually planned so, or disappeared from attack of the Ryukyu he served long years, or Ryukyu kingdom might made a trick to purge strong general along with wealth and ambitious lord. 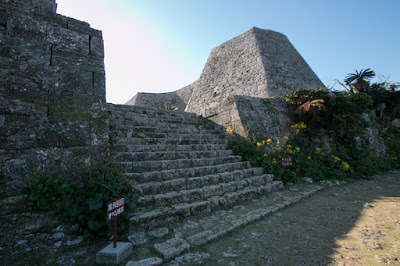 Anyway Gosamaru is popular as a loyal general among local people still now. There was no severe military tension any more, and fortress exceeds Nakagusuku castle was never built. After the fall of Gosamaru, Nakagusuku castle had been managed by kingdom for a while and abolished. 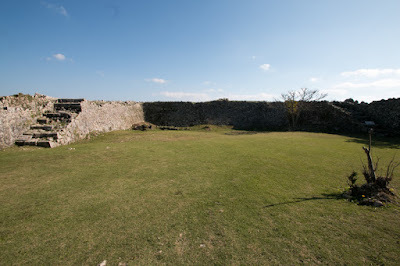 The site of the castle had been used as a local office, and after WW2 it became a historical park. 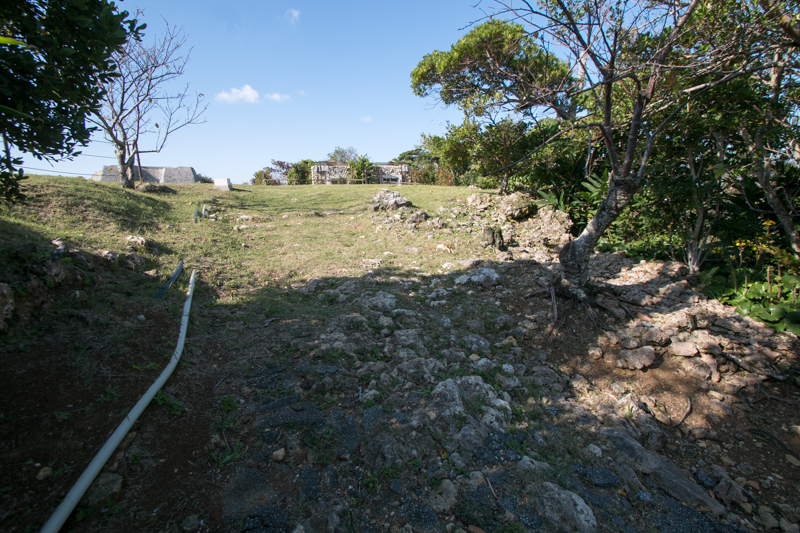 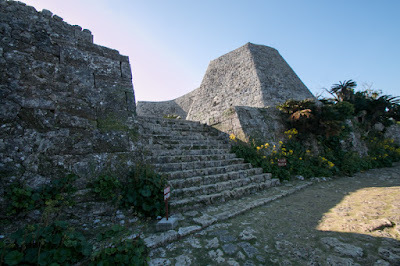 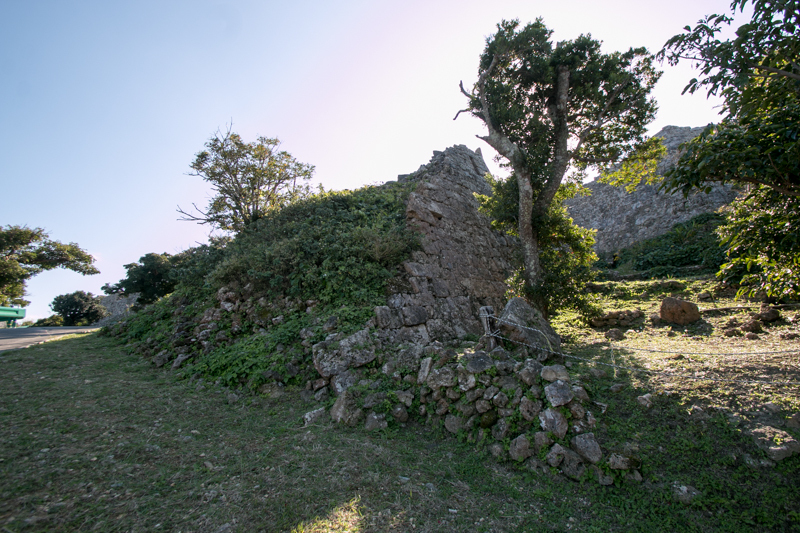 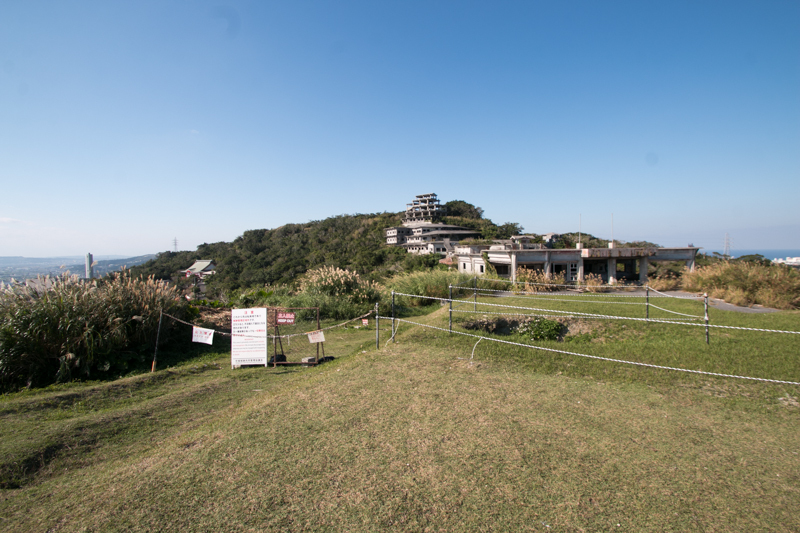 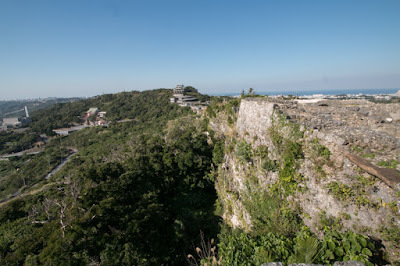 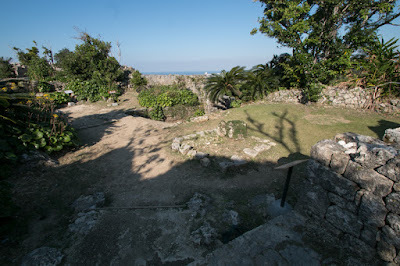 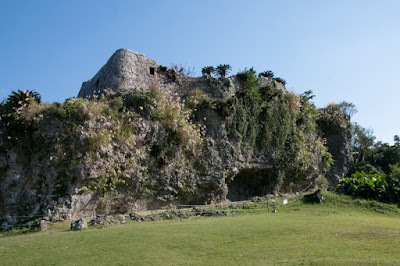 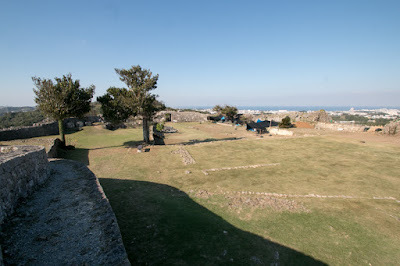 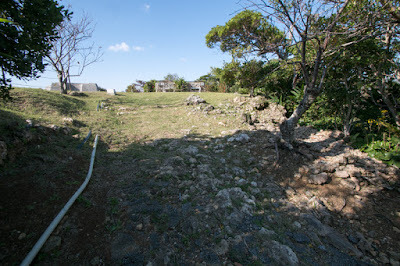 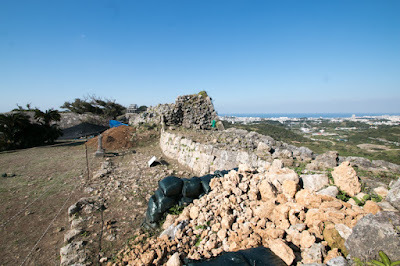 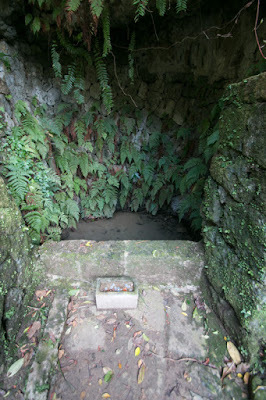 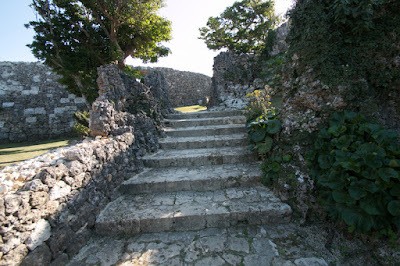 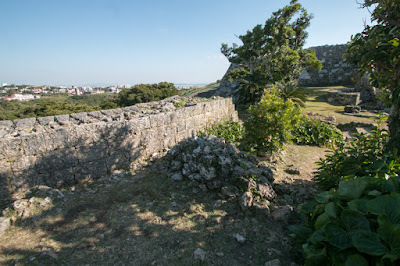 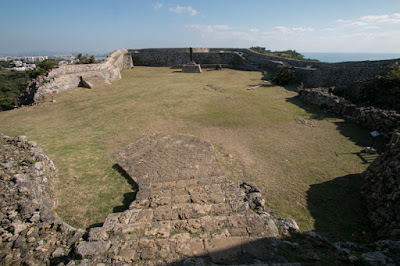 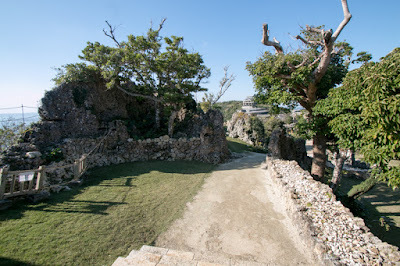 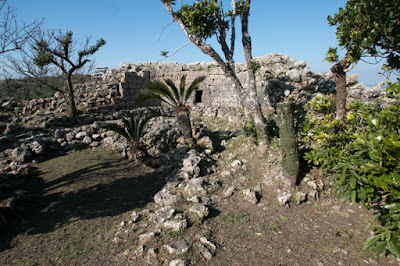 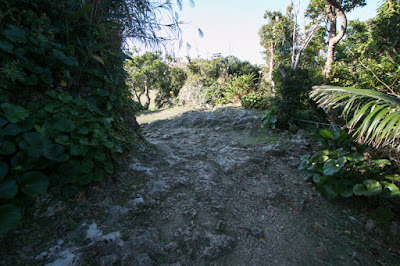 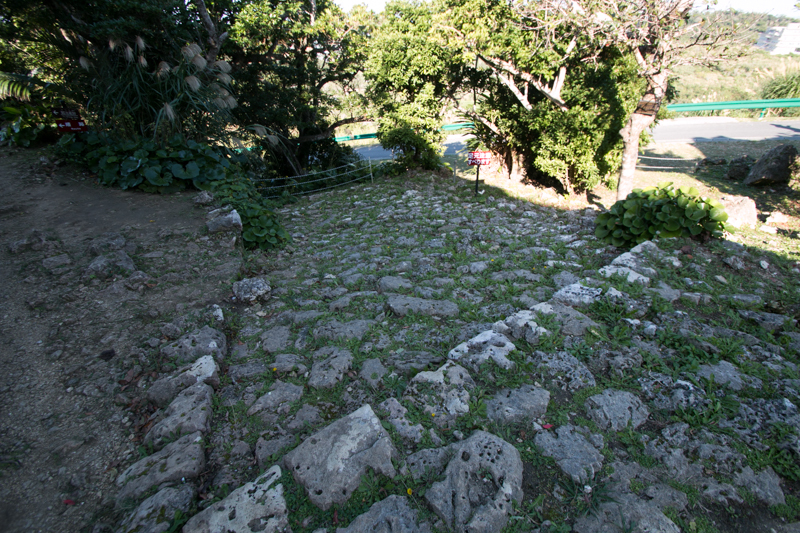 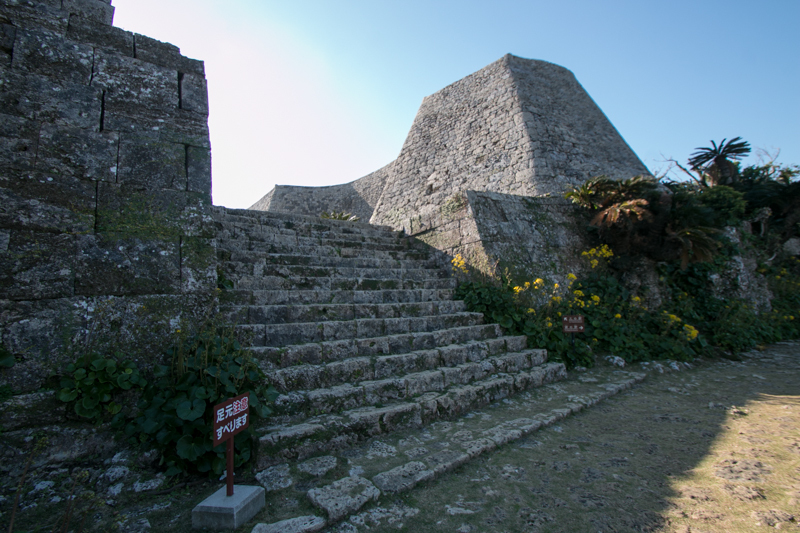 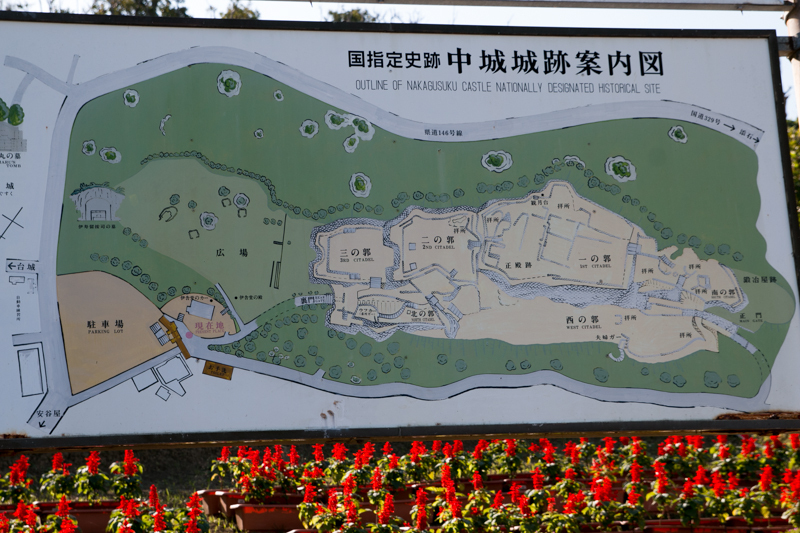 The site of the castle was nominated as World Heritage collectively with other Okinawa castles in 2000, and repair of castle is still ongoing. 10 minutes drive from Okinawa Jidoshado Expressway Kitanakagusuku interchange.